It is always confusing for me what to cook for lunch and dinner daily because of the limited variety of vegetables and greens available here.Dill leaves is one of the greens which are abundantly available here but I rarely cook them at home.My mom makes excellent stir fry with the dal and greens mixture which is surprisingly very dry and complements well with both rice and roti.I like to eat this stir-fry especially with roti as it complements very well with it.Even the rasam which is made up of this mixture is very simple and flavorful and the meal with both the stir fry and rasam is simply yummy.If you like the flavor of dill leaves you will definitely like this combo,give it a try to believe my words. Pressure cook dal and dill leaves for 1 whistle.Do not cook more otherwise the dal becomes mushy.You can even cook this on stove top until the dal is cooked slightly. Strain the water from the above dal-dill mixture and squeeze out the extra water from it.Save the water which is strained and sueezed fom this mixture for making rasam. Heat oil in a kadai crackle mustard seeds and add urad and chana dal and fry until golden in color. Add finely sliced onions and green chilli paste and fry until they are light brown in color. Add the squeezed dill leaves-dal mixture to it and fry for a minute. Add tamarind paste,jaggery,sambar powder,salt and fry until the mixture is dry and all the masala's are well blended. Serve it hot with rice/chapathi/roti. Adjust tamarind,jaggery and spicyness according to your taste. Heat the water along with the cooked dal and add tamarind pulp,salt, jaggery,rasam/sambar powder to it and boil properly. In a small tadka pan heat oil/ghee and crackle mustard seeds and add curry leaves,hing to it and add the tadka to the boiled rasam and cover it with lid. I rarely used dill leaves in my cooking, rasam and palya looks irresistible and delicious Prathy.. The rasam is aromatic! I'd like to drink some! The stir-fry is lovely! Dill must make both the dishes strongly-flavoured! This looks so lovely! Never made this..thanks for posting it! Thats wonderful meal..looks great... Ha ha i believe your words. And I love dill fragrance and taste in anything.. wonderful meal with dill leaves. All time fav and comfort food! 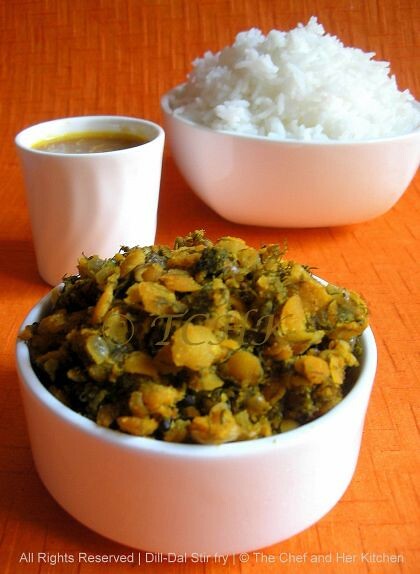 nice idea of cooking dill leaves in indian style..have not used dill in my cooking yet..need to try...looks so healthy and delicious stir fry..
That must be a lovely flavoured dhal and rasam, looks delicious. Your pictures look really good. Delicious dish, lovely presentation ! Two in one recipe. Lovely. I don't get dil leaves here. I might try with some other green and dal combo. Sure, aromatic healthy recipe...looks great. Love the idea. Yummy food. Looks so good. Nice recipe... YUM! Gorgeous pic Prathy and a hearty meal too.. It must be really aromatic and yumm with dill. First time here..lovely space you have with healthy recipe collections. 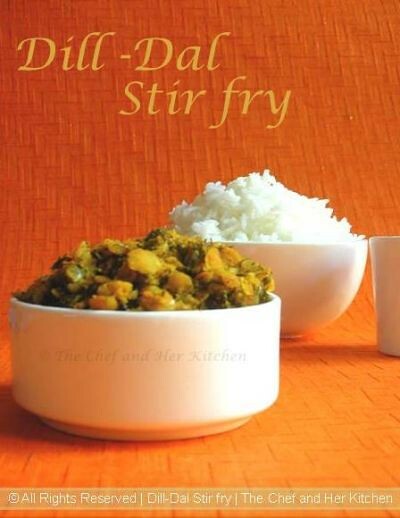 Dal stir fry sounds yummy n delish. I make only dill rice, should try this one too. Both looks yummy. Nice click. What a gorgeous pic! Looks very inviting! thats a lovely looking lentil dish pavithra.never used dill but with this dish you have tempted me to try it out.